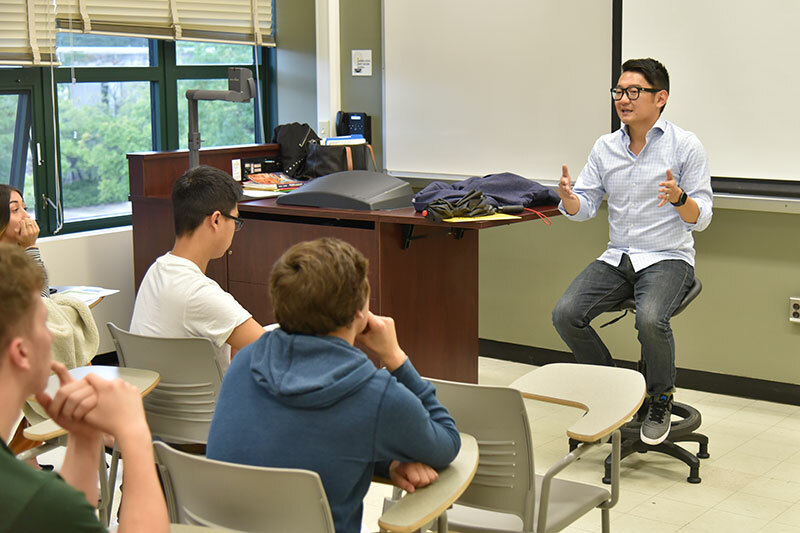 A panelist for the 14th annual Lewis B. O’Donnell Media Summit, Jeff Knauss, class of 2007 and co-founder of Digital Hyve marketing agency, speaks Oct. 17 to Rose Marie Crisalli’s communication studies class in Mahar Hall. 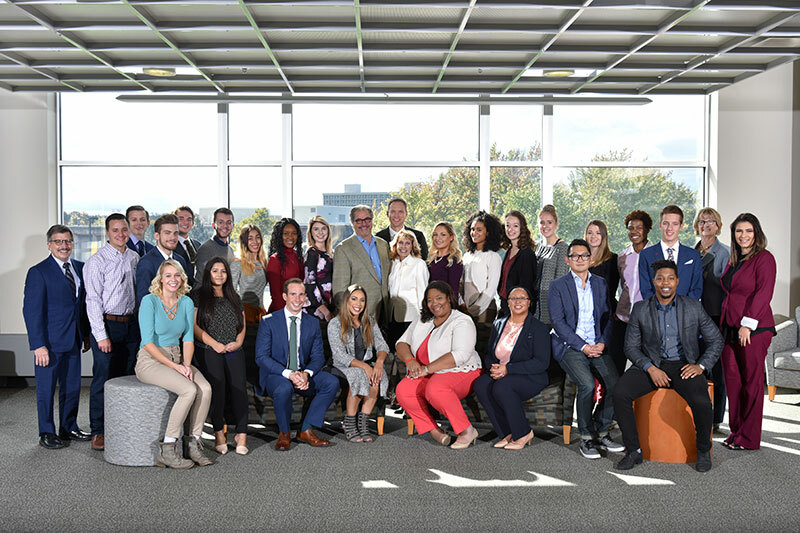 The summit’s panelists and Career Connectors fanned out to appear in classes and networking events. 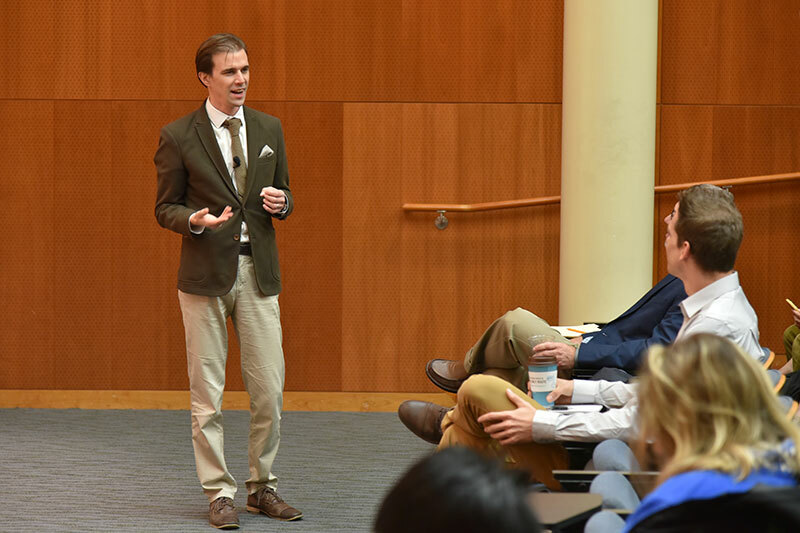 Knauss, who frequently returns to campus for such events as the “Launch It” student entrepreneurial competition, was also the featured speaker at the December 2017 commencement. 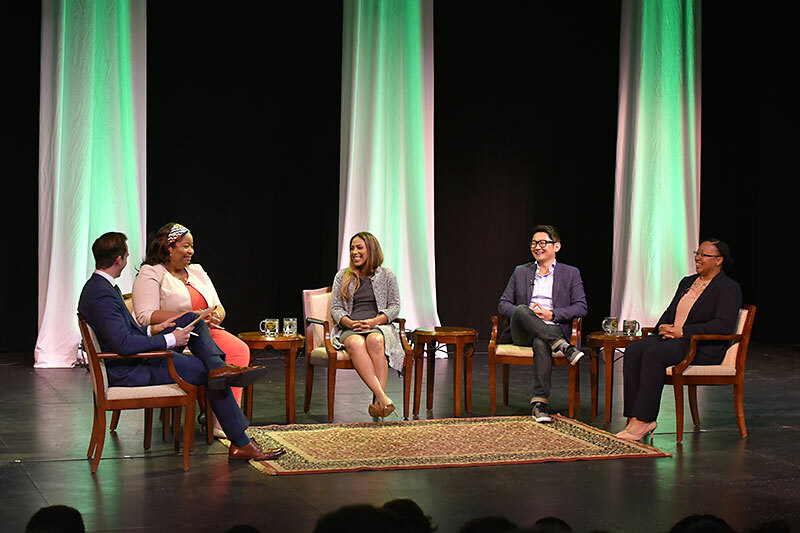 Asa Stackel (left), a 2012 alumnus in broadcasting and mass communications and now morning show co-host at Albany station WNYT-TV, moderates the 2018 Lewis B. O’Donnell Media Summit, titled "Viral Voices: Advocacy in the Digital Age” in Waterman Theatre as it airs air live Oct. 17 on student-run WTOP-TV. From left are panelists Brandi Boatner of IBM Corporate Communications, social and influencer communications lead, global markets; Gina Iliev, health equity coordinator for Planned Parenthood of Central and Western New York; Jeff Knauss, a 2007 Oswego alumnus who is co-founder of full-service digital marketing agency Digital Hyve; and Latoya Lee, a sociology faculty member at SUNY Oswego whose research focuses on the ways in which people of color use social media for political organizing, social transformation and the (re)making of value systems. Media Summit panelists, Career Connectors, ambassadors, interns, other faculty and student organizers, and co-event directors Boni Quatroche and Abigail Buttacavoli (flanking Media Summit founder Louis A. Borrelli Jr. and college President Deborah F. Stanley, center) gather for a group portrait Oct. 17 in Marano Campus Center’s Hearth Lounge. Michael Riecke of the communication studies faculty, advisor and mentor to the student organizers, is behind Stanley. Founded in 2005, the summit later was named named in memory of their beloved professor, the late Dr. Lewis B. O’ Donnell, by Borrelli, class of 1977, and his good friend, NBC “Today” show host Al Roker of the class of 1976. 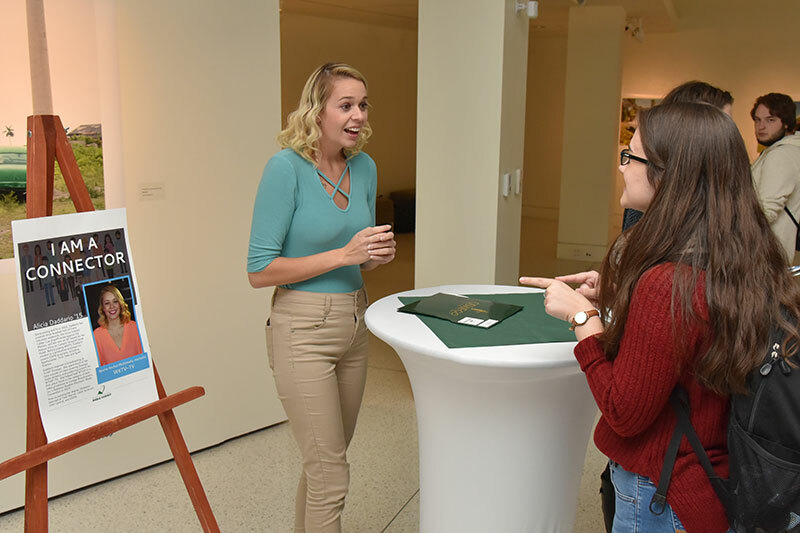 Alicia Daddario (left), a 2015 alumna, Media Summit Career Connector and sports anchor/reporter for WKTV-TV in Utica, attends to a student Oct. 17 at the annual one-on-one networking event in Tyler Art Gallery following the 2018 Media Summit. 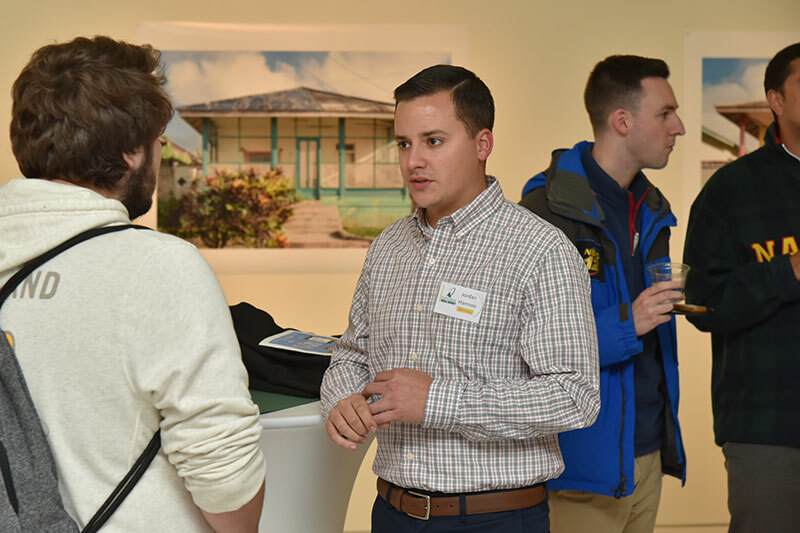 Media Summit Career Connector and 2015 alumnus Jordan Harmon, director of production at ABC Creative in Syracuse, speaks Oct. 17 with a student at the networking event in Tyler Art Gallery. SUNY Oswego students gather following National Grid’s first-ever SUNY career day at the gas and electric utility’s Liverpool facilities. 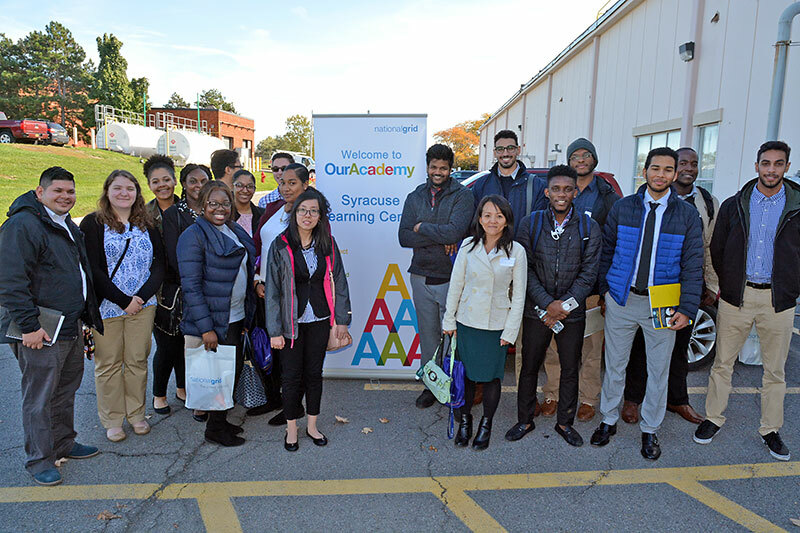 The five-hour event, “National Grid - SUNY Career Connections Day,” provided a total of about 30 Oswego students, plus others from SUNY Cortland, with tours of the company’s labs for gas and electrical operations training, as well as the critical, zero-defect environment of the Transmission Control Center. 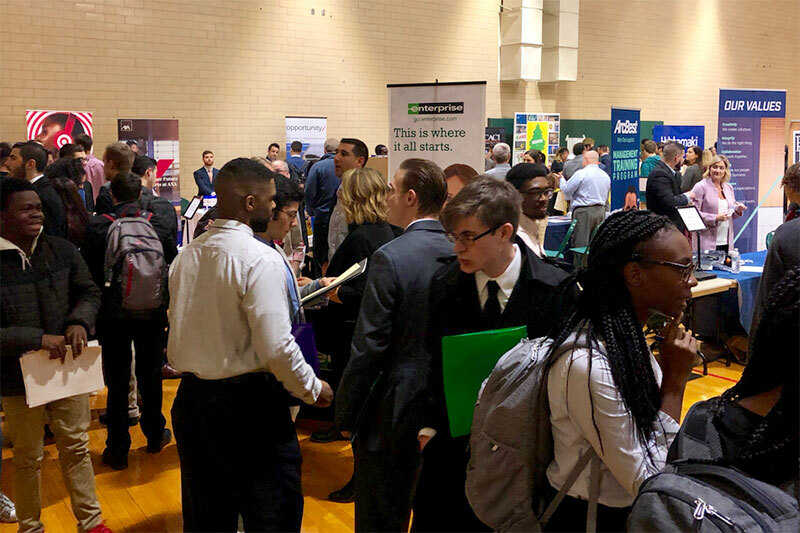 The company emphasized the wide array of jobs available across National Grid’s multi-state service area, and offered a career fair and an opportunity for students to network with employees. Kenny Roffo, a 2017 SUNY Oswego graduate and now a NASA software engineer, speaks Oct. 23 in 132 Shineman Center about his current project in a Science Today lecture titled “InSight: The Next Mars Lander.” Roffo also talked about his early experiences in getting his internship at the NASA Jet Propulsion Laboratory and then ultimately getting his job there, providing anecdotal insights into the innovative problem-solving drive of the engineers he’s met so far. 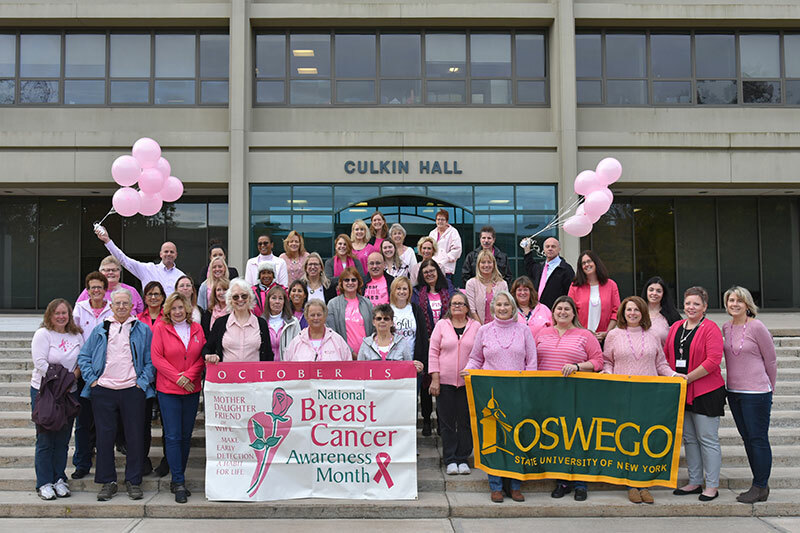 Employees of SUNY Oswego think pink on Oct. 26 to raise funds for the fight against breast cancer. This was the college’s 19th year participating in the observance of Breast Cancer Awareness Month. Employees who donated $5 for the Oswego Opportunities Cancer Services Program got to wear jeans along with their favorite pink attire, raising $565 for the cause. Members of the campus community stand up to sexual violence Oct. 24 in Marano Campus Center during It’s On Us Day. Those who made the It’s On Us pledge earned a free T-shirt. For more information about the pledge, visit ItsOnUs.org. Contact Lisa Evaneski, the college’s Title IX coordinator, at lisa.evaneski@oswego.edu for information on SUNY Oswego’s It’s On Us prevention efforts. 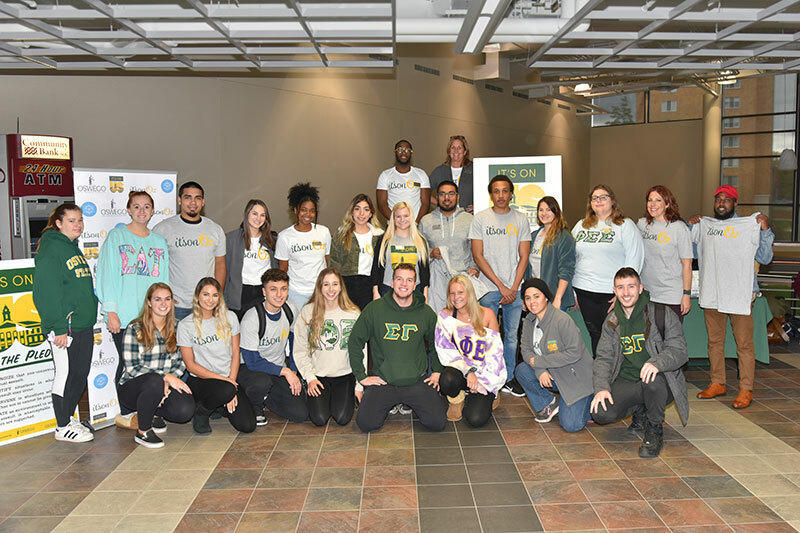 The college technology department's 79th annual Technology Fall Conference ran Oct. 26 and 27 with sessions and demonstrations presented and attended by hundreds of educators (many Oswego alumni) and current students. Here, Daniel Tryon of Oswego's technology faculty and Lindsey Kregel, a technology education major, do some tablet-assisted drawing in the "Doodling as a Creative Bridge to Technical Drawing" workshop, one of many breakout sessions on how to use technology, tools and creativity on all levels of education. 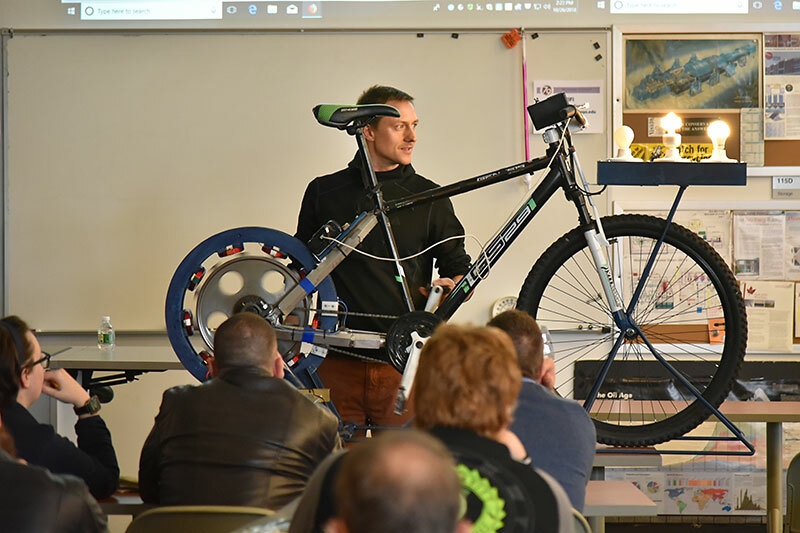 Presenter Michael Uchal, SUNY Oswego class of 2005, explains his bicycle generator during his Technology Fall Conference session Oct. 25 in the Transportation Lab, 115 Park Hall, where he also talked about wind turbines, wood-powered vehicles and an airboat. 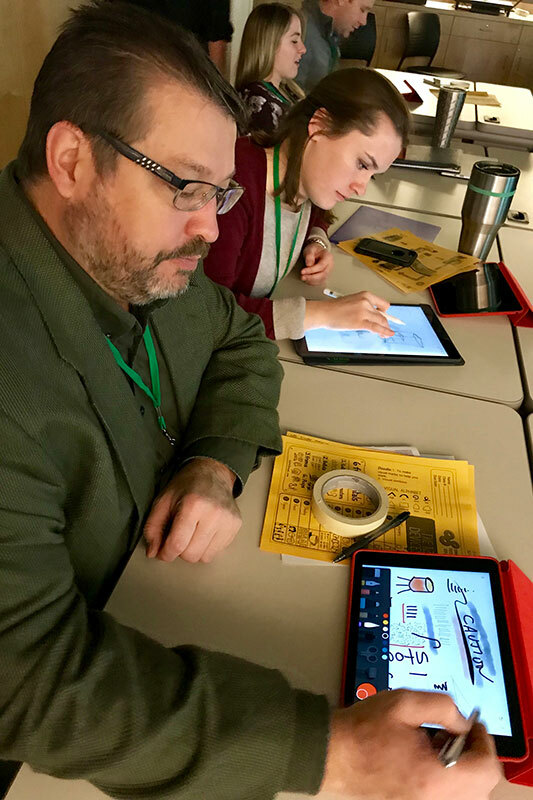 The two-day conference was open to all kindergarten through college educators and professionals who wanted to find out the latest developments in technology education and network with other educators and professionals. 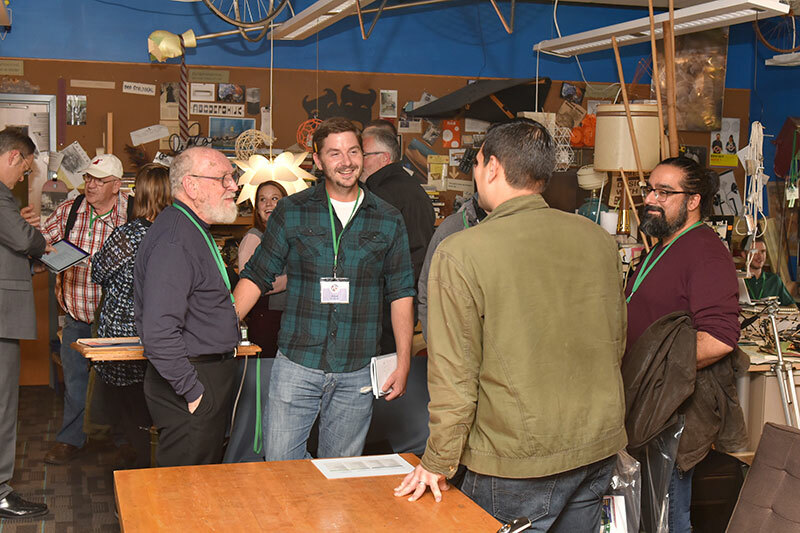 A member of the technology faculty for more than 40 years, John Belt (in gray sweater) talks with Technology Fall Conference attendees Oct. 25 in his unique Park Hall design lab. 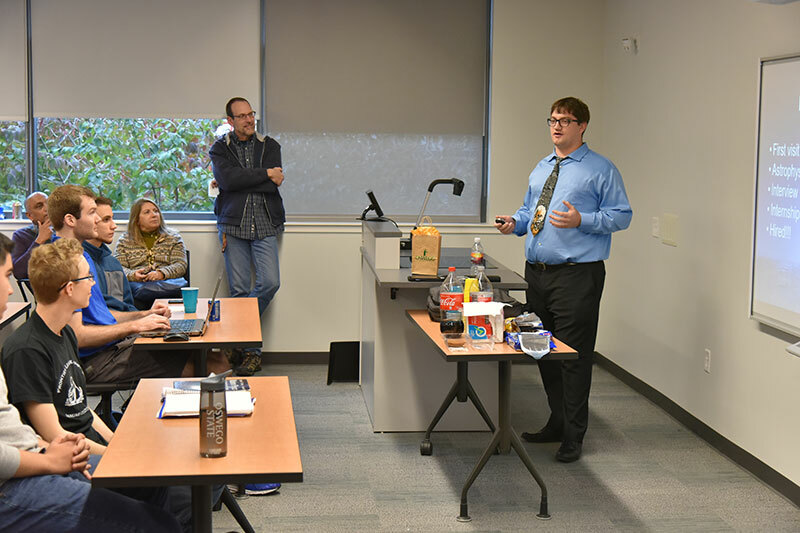 David Morrow, director of research at the Forum for Climate Engineering Assessment at American University, speaks on “Climate Justice and Carbon Renewal” Oct. 25 in Marano Campus Center auditorium in the 30th annual Warren Steinkraus Lecture on Human Ideals. He studies climate ethics and climate policy with a particular focus on the ethics and governance of solar geoengineering and carbon removal. Robert Card of Oswego’s department of philosophy made opening remarks. 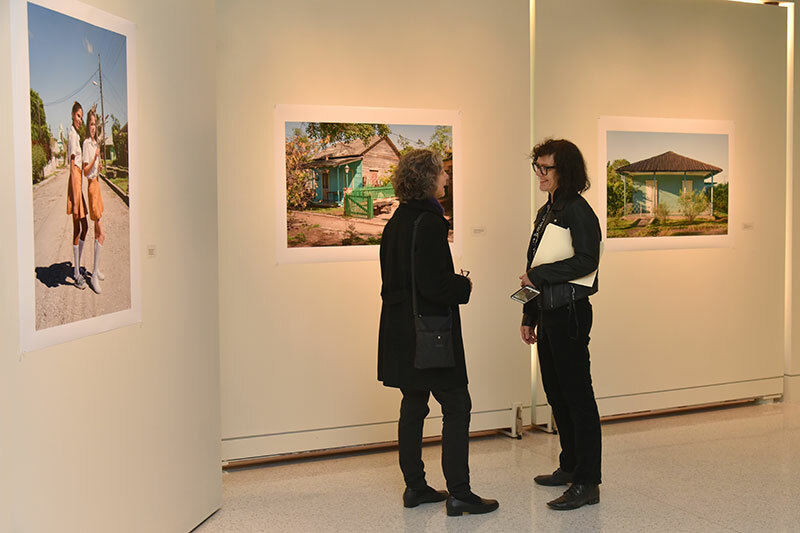 Photographer and art faculty member Julieve Jubin (right) converses Oct. 26 with Mindy Ostrow, former director of Tyler Art Gallery and now with River’s End Bookstore in downtown Oswego, at the opening of Jubin’s exhibition, “Hershey: A Cuban American Story.” Founded by the late chocolate magnate Milton Hershey in 1918, the uniquely American-designed company town of Central Hershey, Cuba -- renamed Camilo Cienfuegos after a Cuban revolutionary -- has served as a subject for Jubin’s lens since 2011. The exhibit runs through Nov. 18 at the gallery in Tyler Hall. 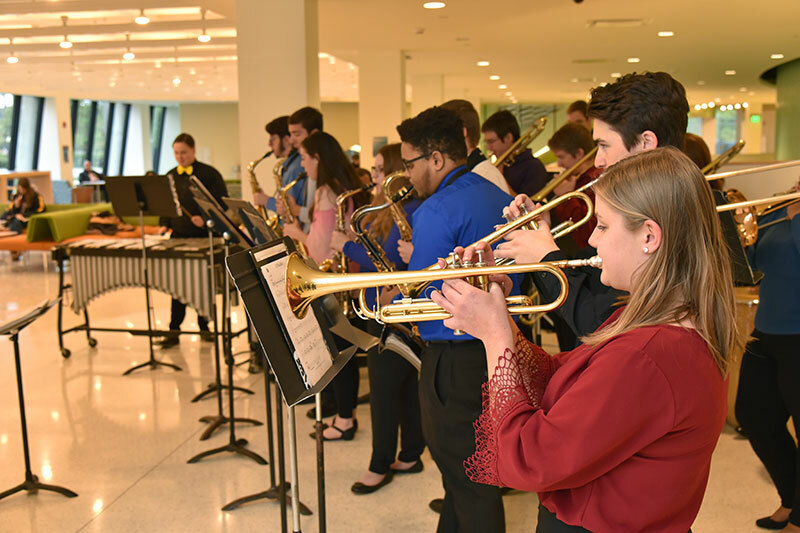 The college's Latin jazz band, directed by music faculty member Eric Schmitz (not pictured), performs Oct. 26 in Tyler Hall lobby to mark the opening of art faculty member Julieve Jubin’s exhibition of photographs from Central Hershey, Cuba, now known as Camilo Cienfuegos. The ensemble is made up of more than 20 students from across campus and focuses on the study and performance of popular music from Cuba, Puerto Rico, the United States and South America. 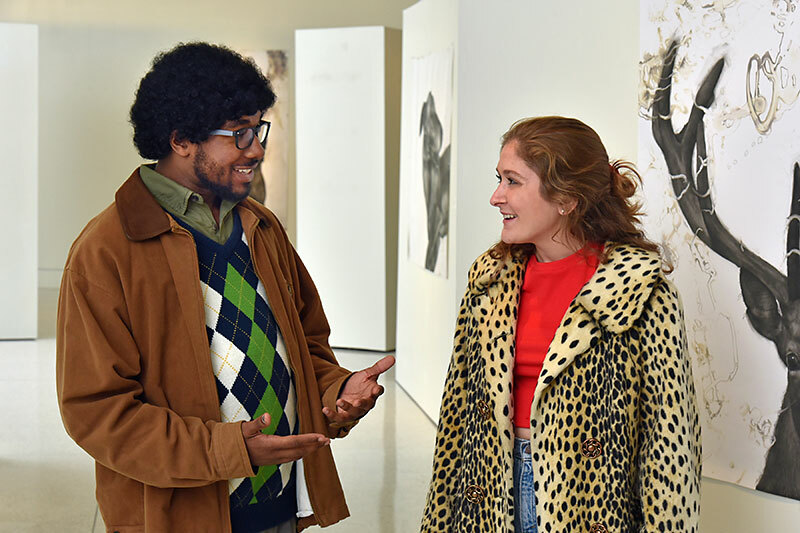 Adam and Evelyn (Trey Thomas and Michaela Buckley, both serving as understudies on the lead roles) meet at an art studio -- for this photo, it’s Tyler Art Gallery during art faculty member Juan Perdiguero’s recent “Animalario” exhibition -- in a scene from the theatre department’s production of “The Shape of Things.” Behind the scenes, students, faculty and staff have worked hard to mold the Neil LaBute play into “a collaborative art form.” The play opens Wednesday, Nov. 7, for a five-performance run. Ticket information is available at tickets.oswego.edu, any SUNY Oswego Box Office or by calling 315-312-3073.